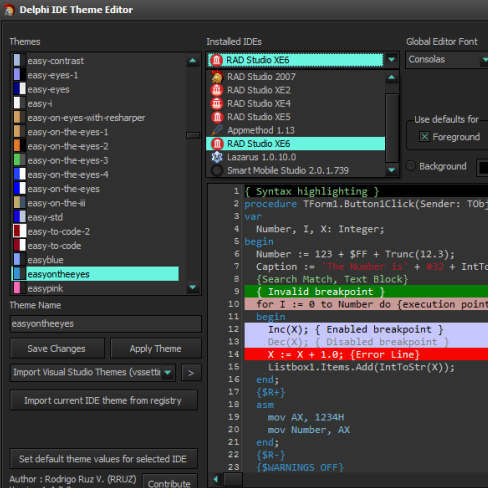 Rodrigo Ruz has released a new version of the Delphi IDE Theme Editor (DITE) with support for Delphi XE5, Delphi XE6, and AppMethod. The Delphi IDE Theme Editor allows you to customize the code editor window foreground and background colors in addition to customizing the font used in the code editor. Additionally, you can import Visual Studio themes and use them within Delphi as well using DITE. There are a huge list of prebuilt themes for you to choose from or you can customize the colors yourself. It looks like DITE is also built in Delphi (just like the Delphi IDE) so that is pretty awesome. Just as an example you can change the background color of the code editor window in the IDE to dark grey and the text to a light gray verses the standard black text on a white background. DITE is a free utility. Head over, check out the screenshots, and then download the Delphi IDE Theme Editor.